Modern Structural Biology uses 3 experimental methods to determine medium and high resolution structures of macromolecules. These include X-ray crystallography, Nuclear Magnetic Resonance Spectroscopy (NMR) and Structural Electron Micrsocopy. Research in these areas makes extensive use of BioInformatics tools to evaluate protein superfamilies, select appropriate protein coding regions for cloning and over-expression and to analyze the results of a structure determination. 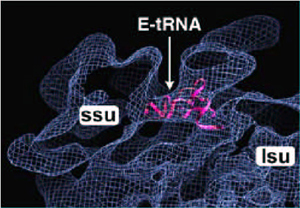 Molecular biology methods are used to produce most of the proteins that are being studied. Department facilities for Structural Biology are excellent and include a new Raxis IV for cryo-crystallography and a Tecnai 200 kV Field Emission Gun (FEG) electron cryo-microscope. A map of the dNLP-core chaperone at a resolution of 1.5 Å highlights a well ordered ß-hairpin that may play a role in histone binding. Image courtesy of V.M.H. Namboodiri & C.W. Akey. In this approach, macromolecules must be crystallized and this requires the over-expression and purification of milligram quantities of proteins and nucleic acids. Once a protein or complex is crystallized, its diffraction quality is evaluated at our in-house X-ray crystallography laboratory using either an R-axis II or IV camera system. Diffraction patterns may be collected from crystals at room temperature or at liquid nitrogen temperature. To achieve higher resolution and carry out Multi-wavelength anomalous dispersion (MAD) phasing, we generally take crystals to the National Synchrotron Light Source (Brookhaven, New York) or to other synchrotrons like CHESS (Cornell University, New York) or the Advanced Photon Source (Argonne National Laboratory, Illinois). Members of the Department are particularly interested in the structure and function of enzymes and intramolecular proteases, chaperones, large macromoleculer complexes (such as chaperone-histone complexes, restriction endonuclease-DNA complexes etc.) DNA transcription factors, annexins and proteins that interact at membrane surfaces, lipoproteins, receptors, channel forming proteins and actin binding proteins. 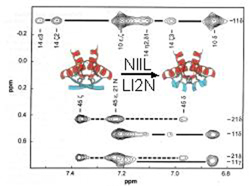 This region of the 2D-NOESY NMR spectrum reveals that switching two amino acids in the sequence of the phage P22 ARC repressor results in a sheet to helix structural transition in the NllL/L12N mutant. Image courtesy of M.H.J. Cordes, R.T. Sauer, N.P. Walsh & C.J. McKnight. 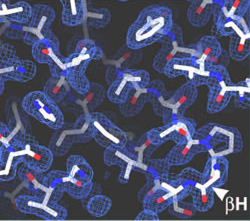 NMR structures give a series of snapshots of the dynamic motions of macromolecules. Importantly, these macromolecules do not have to be crystallized. However, they must be stable and soluble to achieve the concentrations required for data collection. Proteins are generally over-expressed in a system that allows selective labeling with various isotopes to give more informative spectra. After peak assignments have been made, a geometrical analysis gives an ensemble of structures that do not violate the given constraints. Currently proteins up to ~30,000 may be used for de novo structural analysis, but this boundary is constantly being pushed upwards with new technology, as witnessed by a recent analysis of the GroEL-GroES complex (Nature, 2002; 418: 207-211). Members of the Department are particularly interested in the structure and dynamics of headpiece domains, proteins which bind lipids and lipoprotein domains (please see NMR facility page). The development of a practical method to prepare specimen frozen in a thin film of vitreous ice, has opened the door to the structure determination of native specimen using the electron microscope (electron cryo-microscopy). This method of structural analysis can be applied to single particles, viruses, helices and thin 2D crystals and thus is quite versatile. Currently, the resolution that can be achieved depends upon a number of factors including the type of specimen and their intrinsic order. However, single particle methods have achieved ~6 Å resolution with viruses, while helical particles and 2D crystals may provide 3D maps with a resolution of 8-3.5 Å resolution. Importantly, large complexes can be studied with this method and high resolution models determined by X-ray crystallography or NMR can be docked within the EM derived 3D maps, to provide insights into the functions of these machines. We have recently expanded our Structural EM facility, to include a Tecnai 200 kV FEG electron microscope for medium and high resolution work on biological specimens. Members of the Faculty are currently interested in the structure of bacterial adhesion pili, yeast spindle pole bodies, actin thin filaments, viral RNA-polymerase tubes and crystals, ribosome-channel complexes from the ER and associated protein translocation components, the apoptosome, nuclear pore complexes, receptors and LDL particles.